25th July 2015 and Rangers took to the field at Easter Road with their newly assembled team compiled by highly-coveted manager Mark Warburton and after a patchy first 40 minutes including being a goal down, James Tavernier’s stunning free kick equaliser ensured the travelling side never looked back and found the net another five times. The performance destroyed the home side, following a season where then-manager Alan Stubbs’ men had the measure of Ally McCoist, Kenny McDowall then nearly Stuart McCall’s side too. Things looked bright, very bright, and over the course of the season, despite the odd inevitable blip here and there, Rangers fair coasted their way to the title with room to spare. Mark Warburton looked to be the answer Rangers fans had sought for so long, and following that Old Firm semi victory, the path forward seemed more sure-footed now than it ever had. While there were a few questions about the defence and lack of plan B, and a valid observation that Rangers’ form had painfully dipped since aforementioned victory v Celtic, the summer window was upon us and Warbs would dip into the market and build a team ready to compete in the SPL. Only…it simply has not worked out that way. Yes, Rangers have not absolutely disgraced themselves in Scotland’s top flight, but the harsh truth is yesterday’s Old Firm semifinal showed just how far behind Celtic Rangers truly are, as if the league pummelling which preceded it had not already. And it is not helped by a manager who appears totally out of his depth and incapable of managing Rangers the way they need to be managed. Rangers, in blunt harsh truth, have not progressed since Warburton’s debut in Edinburgh. There has been absolutely no development in any area, no improvement in any sense, and only those who swear by this regime would say different. Rangers started yesterday’s Old Firm semi with, effectively, last season’s team. Only Gilks, Hill, Hodson and Windass stopped it being the usual selection, and it is anyone’s guess what formation Warburton was actually trying – credit to him for throwing in Hodson as well as Tavernier, for trying something slightly different, but this looked like a patchwork solution which had not been tested – and Celtic was a heck of a testbed. By 88 minutes, only astonishing goalkeeping from the outstanding Gilks plus some crucial interventions by the surprisingly impressive Rob Kiernan stopped this from being the most embarrassing result in the history of the Old Firm. The attempts on goal were like target practice, and it was a near miracle the scoreline did not go into double digits. In the end, Dembele’s goal was of the quality it took to beat Gilks on a day he seemed impassable, and the score is one which scarcely told the story of a one-sided match. Some more harsh truths, folks. That is now five Old Firm whitewashes in a row Rangers have suffered – the loss in 2012 at Parkhead, the loss at Hampden in 2015, the semifinal in April, the Parkhead debacle which followed it and now this. As a fellow fan said to me yesterday, the win (not against the run of play but certainly against the run of who created more – Celtic had 33 shots to Rangers’ 9) in April was the worst thing that could happen to Rangers – the kick up the backside for Celtic made them realise what they needed to do, and they went out and did it. They got in a great manager, and spent solid money bolstering the squad. Meanwhile Rangers’ summer ‘rebuild’ signed the ‘dream midfield’ of perennially-injured Jordan Rossiter and Niko Kranjcar, plus the powderkeg personality that is Joey Barton. And started yesterday’s clash with none of them. Yet more of Warburton’s signings were either benched or missing – Crooks, Dodoo, O’Halloran, Garner and Senderos – and there is a serious case that January could see something of an exodus given these guys just cannot get a game. In summer of last year, chairman Dave King demanded a team that could not only win the Championship, but make the step up to the SPL – in other words, a team that would get Rangers promoted as well as be ready-made to deal with the SPL and compete credibly. Whether it is the quality of signing or quality of Warburton’s management, that vision simply has not materialised. And only one man can be held accountable to both the standard of recruits acquired and the way they are being handled. This all sounds like something of an angry rant, and in many ways it is – but how much of it is wrong? Is Mark Warburton really doing a good job? Rangers have barely performed since April – six (nearly seven) months of patchy at best displays punctuates where the team is right now, and there seems no obvious way forward. No one expected Rangers to truly challenge for the title, but it is absolutely depressing to see just how far behind their city rivals Rangers are. The worrying thing is just how many fans cut Warburton slack for anything he ever does wrong, which is a heck of a lot these days. The same fans who would have slammed Uncle Walter, or Advocaat – somehow Warbs has achieved Messianic status and shall not be criticised. “In Warbs We Trust” has become the mantra for so many, no matter what happens, and such blind faith is dangerous. 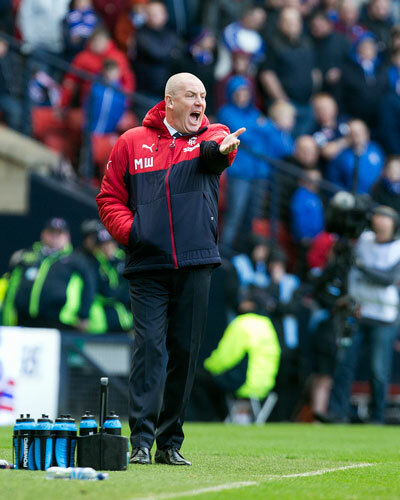 “Mark Warburton has forgotten more about football than you know” – has he, has he really? The man was a city trader till the millennium then, in conjunction with some part time coaching became a staff member at Watford in the mid noughties. He only became a manager full time in late 2013. Does he really know what it takes to manage top flight football in the SPL for a club the stature of Rangers? The question is what makes Mark Warburton so special to a section of Rangers fans that he is above criticism to them? And why is it always the players’ fault? The simple fact is most of them are miles off being good enough (that is a rant in itself), but is it their fault their ability is not sufficient for Rangers’ needs? Whatever the answers to these and other questions, Rangers fans should be asking them of themselves – looking deep in the eye of the abyss and trying to fathom what exactly is wrong rather than just ‘giving it time’. The club has a long, long, LONG way to go before achieving anything like Rangers Standard. Lets face it we were lucky it was only 1/0,septic done their homework not once did rangers play it out from the back the way they have been doing,why because the opposition did not let them do it,they pushed up and made rangers kick it long and ultimately giving the ball away,then we are carrying passengers mckay looks as if he just not interested,before as i remember when a player looses form he gets dropped and somebody else comes in,halliday running about like a headless chicken doing nothing,i hate to say it but scott brown strolled through the game as if it was a sunday kickabout,what has M.O.H done that he cant even get 30 minutes play time,wallace (never a gers captain) badly off form and caused that goal,i have said it before we have some good players,why pay 1.8 mill for a striker and leave him on the bench.one up front will never work for us with the caliber of players we have ,4 4 2 waghorn/garner up front we might get to see some goals and a game of fooball. Warburton is not at fault in my opinion the budget is ! The system can be fantastic but if you are not given a proper budget to buy the quality that can play that system, then it fails before it begins ! Time for that promised £30 million or promised kids inheritance to come out of the moth laden wallet , plus the promised millions from the 3 bears had before winning power , so far it has all been season book money used and still no listing on an exchange , but has more money been used to put up Legend and other banners around Ibrox rather than fixing deep repairs fans have been complaining about for years ,if the deep repairs were being done I could accept budgets elsewhere may have to suffer, but it is not it's just a wee bit a bunting . If the current board kept to all there promises we could be shopping at a better level and doing the much more important work that is needed at the stadium and I do not mean work that will be a benefit for the corporate guests, whilst also backing the manager better financially. As much as I admire and respect the work this current board has done as they have lifted us all from the gloom , if they continue not to back the manager financially and give him at least a third of that £30 million come January then fans will start to take notice and not of any perceived Warburton failings but of the failings of a board, who have so far not kept promises and have failed to back the manager with the promised cold hard cash ! from what i know, there is enough money to pay the wages and keep the lights on. mr king is not cash rich, for the 30 million to happen, all his properties and possessions would have to be sold, i thing we will be in a dog fight , not just this season but for the foreseeable future with Aberdeen and hearts. the board will be looking at other managers, as worse case scenario we will be so far off the pace it will be the only option, why try to play this type of football when we dont have the players. What were you expecting to happen this season? You saw who came in, who we were looking at any being linked with so what did you anticipate would happen? I saw this season as being one of establishment in the top tier and expect Europa League qualification at the end of it. Nothing more. We find ourselves in a unique position. We have just been promoted which would normally mean just trying to survive however as we are Rangers we have instantly become the number 2 (in some cases number 1) scalp for opposing teams. You only need to look at the results teams have gotten against each other to see how much they raise their game against us. Warburton has made mistakes and continues to do so, as all managers do. I am not happy with how little game time O'Halloran gets as I think he could be a big asset when teams try to take the game to us. I am extremely disappointed with the centre back situation and the less said about Barton the better. I am however delighted with the style of football we try to play under Warburton. I am also conscious that Dave King has not provided anywhere near the finds required to truly compete with Celtic but believe this will take time even if he did. Windass and Rossiter have shown plenty of promise only to have injuries, Crooks and Dodoo we haven't seen enough of to comment on (again due to injuries). We need to give the squad time and Warburton time too. What is the alternative? Are we going to start demanding Dave King spends £30 million and possibly put us in financial jeopardy again? Are we going to draft in Billy Davies and go back to crap football? We lost 1-0 yesterday, yes they had plenty of shots on target but it took until the 88th minute for them to score. For once our defence looked OK which is progress. Give Warburton and Weir time, at least this season and the start of the next one. The media are starting to try and create a story about Warburton's position because it is impossible to accept both Glasgow teams making progress at the same time. Given where we have been I believe we are progressing (just think back to McCoist's teams) and need to realise it will take a while longer to get back to where we should be. Couldn't agree more, not sure what people (the author) think(s) the 'Rangers standard' is, but if it's anything pre-liquidation then it costs a heck of a lot more to put together than the current squad. No other manager could do better than WM under current circumstances and no other manager has had to challenge Celtic with so relatively small a budget. I think we'll finish second which is an extra £6-10 mill if we can get into the Europa league, that's an c.35-50% increase in revenue off current levels of c£22mil. Then it it becomes a self reinforcing positive cycle. We were never going to be top dogs first season back anyone who thought we were are deluded. I agree that Warburton is not infallible and I think he has made mistakes but every manager does. Whatever mistakes he has made at this point is no reason to be looking at changing the management team. Sure it hurts having to put with that east end mob beating us but it's pain we're going to have to put up with for a bit longer. The team is running on fumes and it's only October. It was horrible to watch today...No enjoyment, no excitement whatsoever - a drab affair. I have to say that Gilks was excellent BUT why the hell was Wes dropped? Answer - It's a CUP game! This is true unfortunately. Well done to Gilks though that said. McKay should not be playing - he's a good player on the day but Dodoo is fresher, has more ideas and is faster and more energetic. It's time for management to chop this squad up and give others a chance. Enough is enough with automatic choices. O'Halloran for example , with his pace, could have made a difference. If you're reading this Warburton, this team is not fn doing it. This team in the Premiership is actually WORSE than last years team! Drop underachievers and give the likes of Dodoo, O'halloran a chance. These guys on their game would wreck havoc on each wing. It will be a very long time waiting and suffering again and again before we see a team capable of even worrying Celtic never mind competing with them. This site is honest in it's summary of things and all fans should demonstrate until something is done to reverse this tragic trend or we could be worrying about relegation with a few bad results! We dont need 30 million there are players out there,how much did septic pay for dembele,how much did leicester pay for vardy,those are only two of many its the system, we were pathetic going forward and never troubled them its a bad day when we have to rely on a 36 year old (good player as he is) to get goals for us,when we have two goalscorers on the bench waghorn/garner. We need to change the manager and get in someone who defends properly. Traditionally we have always been successful when we have a team based on the foundation of an iron curtain defence and we will never have that with Warburton in charge. I would bring in Souness or Walter as a caretaker until the end of the season or appoint Neil Warnock as our manager, with Stuart McCall as his assistant, immediately. If you are reading this Warburton please do the decent thing and resign, as it is obvious that you are out of your depth. What a dinosaur. Move on. What has Neil warnock ever done to deserve being the manager of Rangers. I'm loving the football we play, it's progressive and exciting. Against better teams (Celtic now unfortunately) we won't be as successful but how many shots on target did the 'mighty' Celtic have against bmg or barca ...? You might have a point about Warnock, but what has Celtic being outclassed by Bmg and Barca got to do with our defence not being up to standard? It was obvious in the summer that the top priority should have been to sign a dominant centre half, instead we got Hill and a panic buy on the last day of the transfer window. Warburton is trying to play a system that is commendable but the quality of player is not there to implement it. He plays favourites, Mckay is so off form that he must dread playing. Play players to their strengths, give them some freedom, don't be scared to change the system. If a player deserves a run in the team its Gilks after Sundays performance but I doubt he will and it normal service will resume on Wednesday night. No one said it was going to be easy but we must be seen to be making progress. Iwould suggest one tactical change.Play 4-1-3-2.I understand the need for a DM so long as it is not AH.He should be given the chance to play on the left-his natural position.That means Rossiter-Crooks there.Nothing seen of this pair yet.Surely one of them could perform there.This would allow a perm of AH,JW,MoH,JH,NK,-even KM could play there and not forgetting young Forrester albeit MW has appeared to.Strike duo chosen on merit-game on. Every ball Garner gets is two feet higher than his head with him always facing his own goal. Waghorn on the right wing and McKay on the left are playing horrible. For goodness sake give MOH and Dodoo a proper run. How the hell are these guys expected to show what their capabilities are? This team has little faith in the system. Waghorn and McKay from the first minute showed they are not interested and should be out.This team need a bloody good shake up and Walter Smith is the only man who could tear this team sheet up and get this ship with a full wind in its sails.Right now we are floundering. It is glaringly obvious this squad has lost its belief. Your comments on Warburton are spot on he has been found out on a number of fronts. Lets start with the 433 system it does not work playing with one striker at Ibrox is ridiculous if anyone one needs proof check out our gd.Summer signings a mixture of the injury prone and has been on fabulous salaries but contributing next to nothing. Rangers would have been inundated with agents in the summer offering players from all over the world and we end up with nothing with a resale value. Yesterday was all about containment and that simply is totally unacceptable. "It was a near miracle the scoreline did not go into double digits"? Another 3 mins and it would have been extra time. The best team won - but as we lost £30 million worth of players and income three years ago and as they've currently got several £10's of millions of Euro-money head start, that shouldn't come as a surprise to anyone. It was always going to be like this. Getting past Hearts and Aberdeen is the first objective - ignoring the bitter and twisted Hartson and Sutton is the second. If there is a huge pot of money then get another manager if you really want one. I'd stick with W&W if there was and think it's nuts to change if there isn't. Everyone needs to chill the fcku out its bad enough mutton and fartson getting there tuppence in. Although disappointed you actually think with a couple of bob we will challenge septic not. If anyone wants to give up there seat I know plenty who will take them of there hands. We need players who hurt when we get beat. After we got gubbed 5-1 by the manky mob Kenny and his wife go out for a bevvy and windass says he met rodgers in a west end restaurant. True Rangers men would have went home hanging their heads in shame and went straight to their kip. Exactly! We need a Rangers man as our manager and winners on the park, who hurt when we aren't winning. Souness used to say "show me a good loser and I'll show you a loser", we need to get back to that mentality. As a celtic fan I think it's absolutely terrible what happened to that wee boy yesterday. I hope they catch the cowardly thug ASAP and get him behind bars for a long long time. Nice of Rangers to invite him to the directors box and hopefully the wee lad will get back to enjoying watching his team. Dear Ibrox noise,Ime so pleased to be able to read and comment on Ibrox noise once again...I know that its been very necessary to close the site for a time to hopefully get rid of the trolls...so well done! I think it could be time up for W&W ...it does very much appear they are at there limit for ideas...I would say Rangers should be after Derek Mcinnes or Stuart Mcall both proven on match winning football tactics...R.T.I.D. I think Warburton should be given a chance at least until the end of the season. However, saying that, he needs to play players on form and be willing to change strategy when necessary. Most writing in have already mentioned that. Rangers were poor on Sunday and although improved at the back were unable to keep possession long and were lost up front. Most of all they were too weak. Not just physically but mentallt. Brown, Bitton, and Tierney are not big physically but they controlled the game. They ran for every ball as if their life depended on it. Bitton fouled about 5 players. Rangers should have stopped that after the 2nd foul and taken turns to foul back making sure different players made the fouls. They need to show some gumption. Again weak. Too namby pamby with their fancy haircuts and tattoos. Not enough passion. Windass's dad apparently was a hard nut for Aberdeen and would have left Sviatchenko in the mud. Cant say the same for his son. Mckay needs to be dropped. Hasn't played well since cup semi. Obvious to all. Rangers need to be strong mentally and play harder. Many would give their soul to play for Rangers. I dont see many in the current team like that. Well done, Ibroxnoise for your impassioned comments.